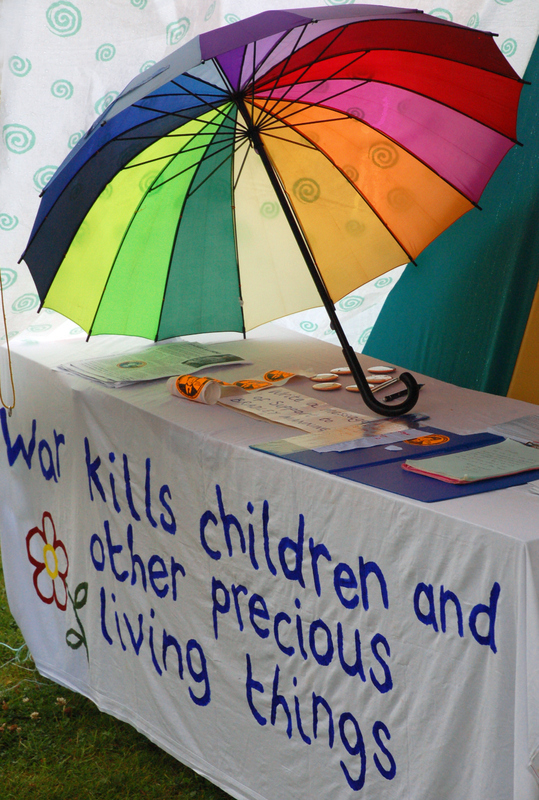 Oswestry Coalition for Peace organised a Peace Picnic on Saturday 4 August to mark the 67th anniversary of the devastating use of nuclear weapons against Hiroshima and Nagasaki. 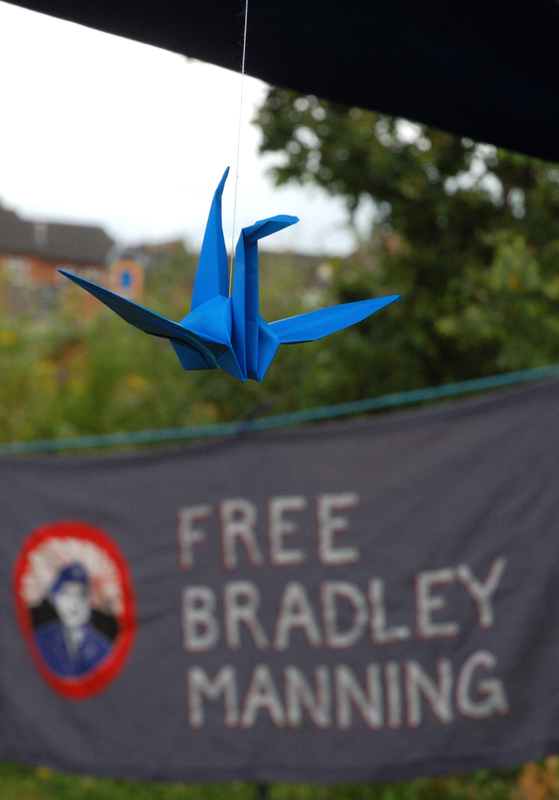 We were invited to bring along a stall for Bradley Manning. 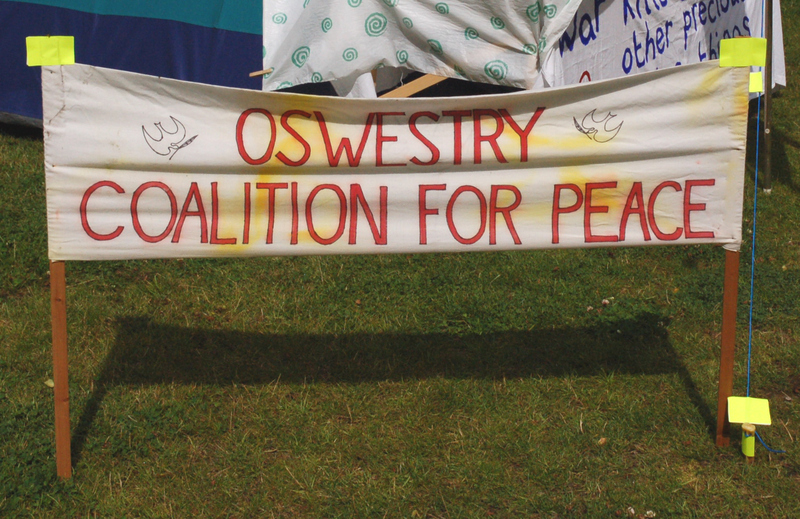 Big thanks to Joan for your help and support with this and to everyone at Oswestry Coalition for Peace for inviting us. 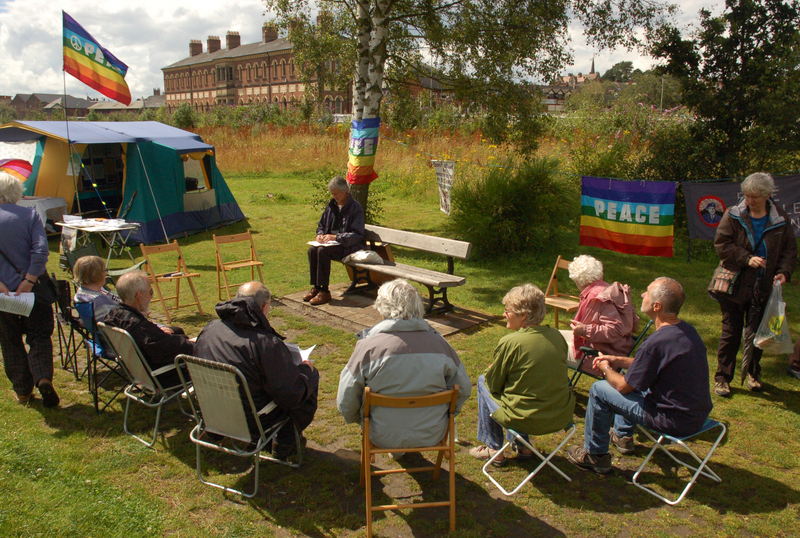 The picnic took place on the new Wilfrid Owen Town Green just behind the old station in Oswestry. 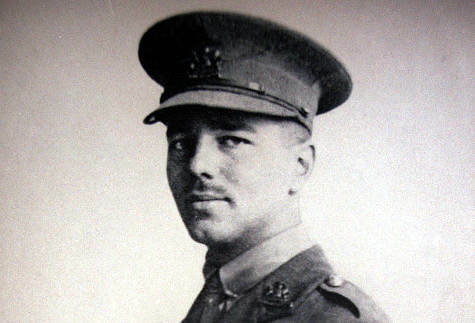 First World War poet Wilfrid Owen was born at Plas Wilmot, Weston Lane, Oswestry. Like Bradley Manning, Owen was a gay soldier who became disillusioned with war. He returned from his first tour of duty injured and ‘shell-shocked’ but, torn between anti-war sentiments and his anxiety about being seen as a coward and traitor, Owen returned to the front in 1918. He was killed in action a week before the war ended. 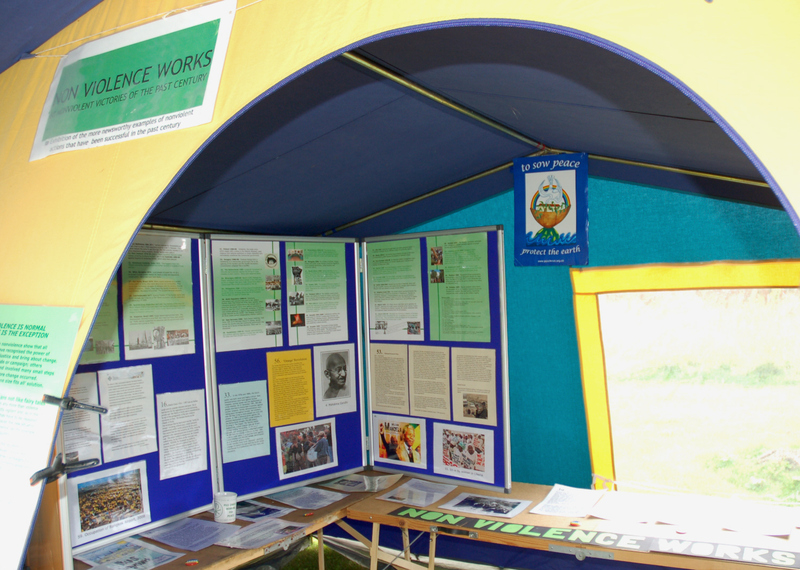 …the other displayed the Pax Christi ‘Nonviolence Works’ exhibition. A couple of information tables held flyers about CAAT, CND, drones and local peace information. 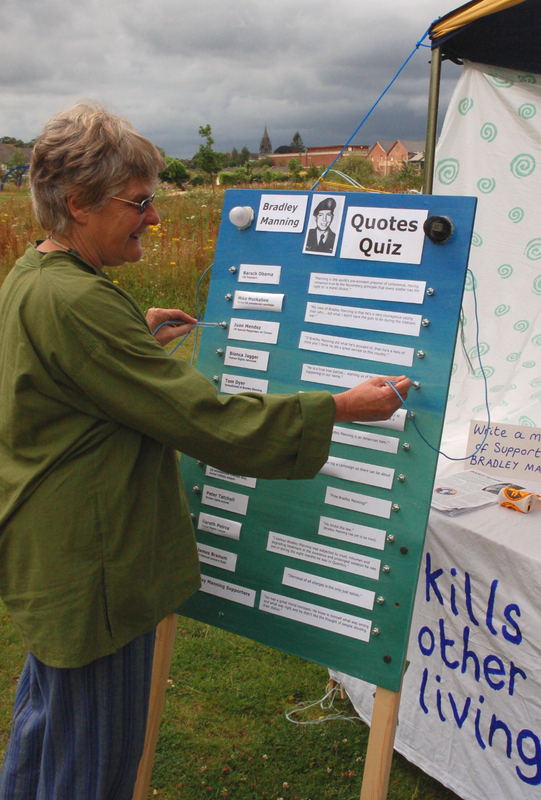 We set up the Bradley Manning stall under the awning of the tent, with the Bradley Manning quotes quiz just outside. 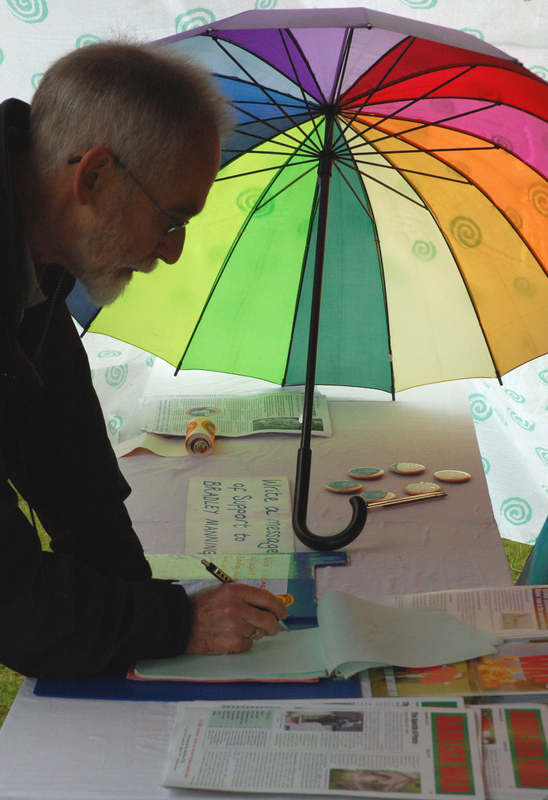 We had letter-writing materials available so people could send a message of solidarity to Brad. If you want to write to him yourself, the details are here. Once that was done I set off into town, just the other side of the old railway station, to find somewhere in good view of the main road to put up our large banners for the day. 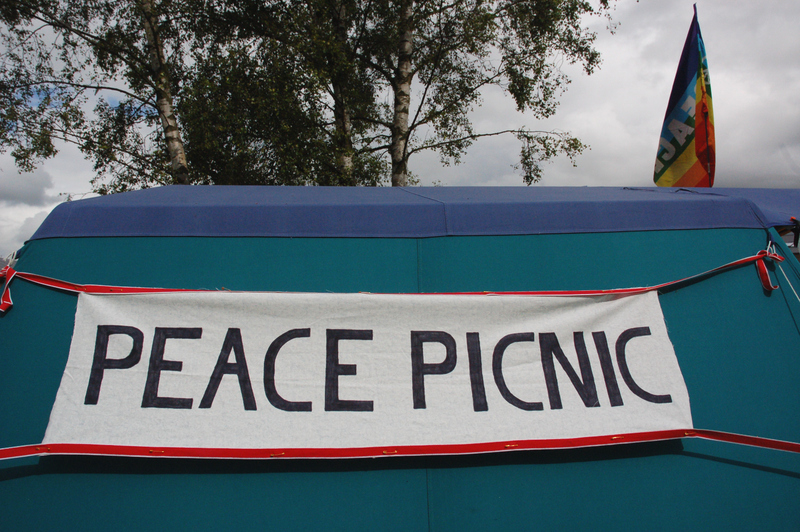 I should make it clear that the banner hang was not part of the official picnic, nor was it endorsed by the organisers. 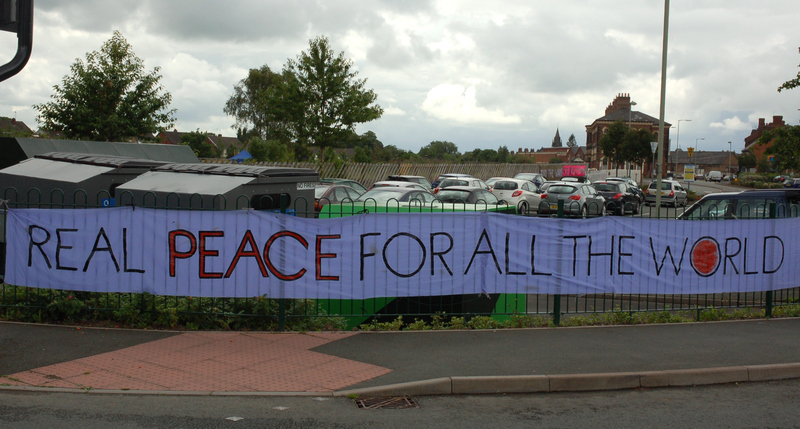 I’d brought along Michael’s great – in all senses – ‘REAL PEACE FOR ALL THE WORLD’ banner, recently rediscovered in a cupboard. This presented a bit of a problem as it proved to be even longer than I’d remembered, but I managed to put it up on the railings on the road junction at the entrance to the Town Green after a bit of re-adjustment to avoid covering up the council’s car park sign. 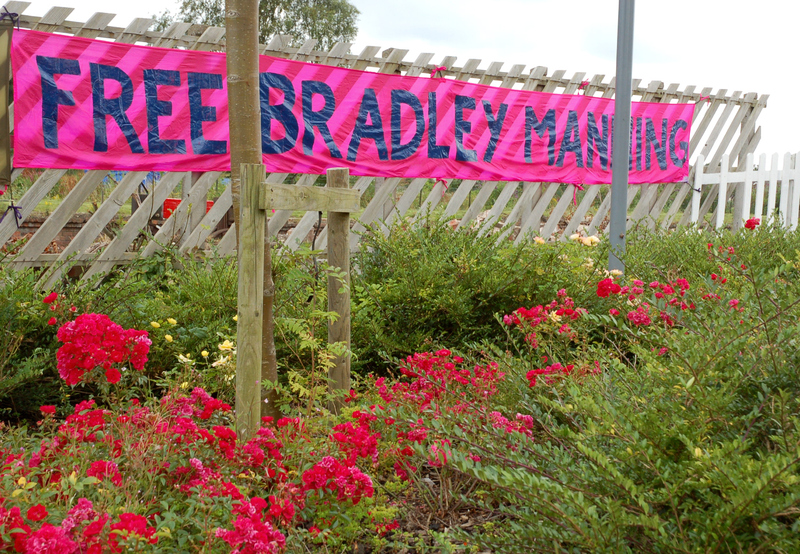 …alongside the ‘FREE BRADLEY MANNING’ banner, nicely set off behind matching pink flowers. We left them up for the duration of the picnic, from 11am until 3pm. Unfortunately, lunchtime was the wettest part of the day and we resorted to picnicking under cover, but soon afterwards the sun came out again, dried up all the rain and we were able to conduct the readings, reflections, poem and song part of the day in a circle outside. This included words of nuclear scientists who went on to oppose the use of nuclear technology for weapons, a reading of Fred Small’s song Cranes Over Hiroshima and Bob Dylan’s With God on Our Side, along with poems and other thoughts. Joan talked about how the true horror of Hiroshima and Nagasaki were suppressed in the mainstream media at the time. Some of the photos taken soon after the bombings have only recently been published. This is why people like Bradley Manning and Julian Assange are so important, because they have brought to the public’s attention the truth about wars that is hidden by governments and a compliant media. 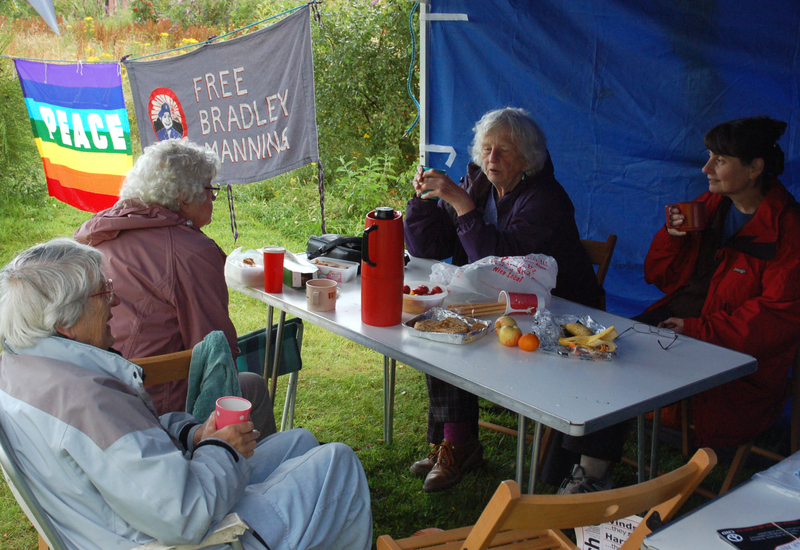 A small group of young lads came over while we were in the circle to ask ‘Who’s Bradley Manning?’ So we explained about Brad, talked about Hiroshima and the reasons we were there. One of them had close relatives who’d served in Afghanistan. Another told us they’d been learning about the Cuban Missile Crisis at school. The lads went on their way and the group then sang a couple of songs before Dr. Robert Tinsley, who is studying Wilfrid Owen’s letters, came to give a reading, triggering a lively and wide-ranging discussion including the inadequacies of mental health after-care for soldiers then and now. This proved to be the busiest time of day for passers-by and I left the circle to spend time with some young adults and a 9 day old baby. This was followed by a discussion with a man who had been a whistleblower himself and had suffered serious and unwarranted consequences (but not untypical, sadly). A musician and healer volunteered to be part of our Peace Day celebrations in Wrexham in September. Conversations were still going on with folk as the structures were dismantled around us in an effort to clear everything away before the next downpour. It was a privilege to be part of this inspiring event and great that local peace groups like Oswestry Coalition for Peace are doing such important outreach work. 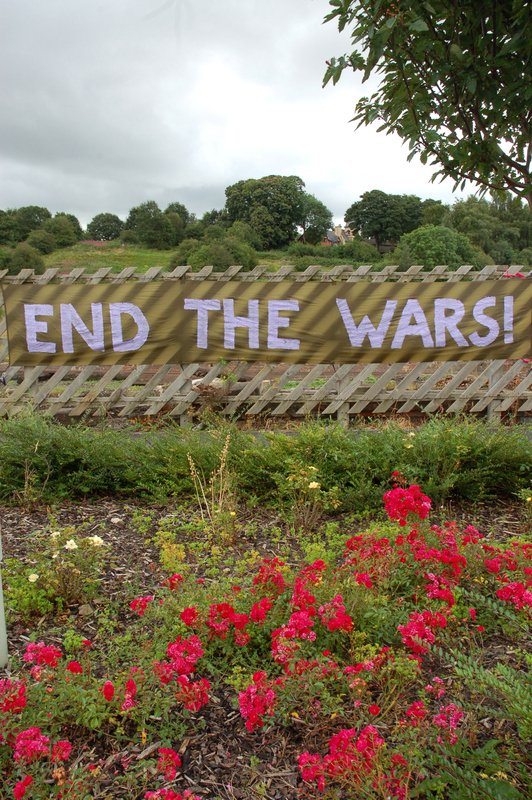 Gallery | This entry was posted in Manning, Reports and tagged anti-militarism, anti-war, Bradley Manning, Britain, England, exhibition, Hiroshima, Oswestry, Peace Picnic, solidarity, Wales, Wilfrid Owen, WISE Up. Bookmark the permalink.